Star fruit is a unique tropical fruit native to South and South-East Asia. When we cut the fruit, each slice resembles the shape of a star, which is where the fruit gets its unusual name. Although this fruit has several health benefits, it also has some serious concerns, and the fruit can even be dangerous for some people. This article examines the nutrition profile, health benefits, and drawbacks of star fruit. However, the fruit now grows around the world, including in Florida in the United States (1). Interestingly, the whole of the fruit (including the skin) is edible, and no special preparation is necessary. Similar to other tropical fruits, star fruit has a high moisture content, and the fruit is approximately 90 % water (2). Star fruit has the sour notes of citrus fruit, the crunchy texture of an apple, and the juiciness and slight sweetness of melon. Since star fruit is very low in sugar, it is only mildly sweet. Also, the sour flavor comes from both the phenolic acids (polyphenols) and the massive amounts of oxalic acid the fruit contains. However, the taste somewhat depends on how ripe the fruit is. Unripe fruit will be sourer than fruit which has had the chance to ripen fully. The photo below shows the appearance of whole star fruit and how it looks when cut into slices. In its whole form, star fruit is about 10 cm in length, and it has five or six ridges running down the length of the fruit on each side. After cutting the fruit into slices, each slice resembles a little star shape. When unripe, the fruit will be a bright green color. However, as the fruit ripens, it progressively becomes a stronger yellow in color. Key Point: Star fruit is a unique and visually appealing tropical fruit with a juicy, sweet, and sour taste. Star fruit looks good, but what nutrients does it contain? Overall, the fruit has an interesting nutrition profile. Unlike other tropical fruits such as mango and pineapple, it is very low in calories, and it contains minimal levels of carbohydrate/sugar. The tables below show the full nutritional values per medium star fruit, which weighs approximately 91 grams (3). 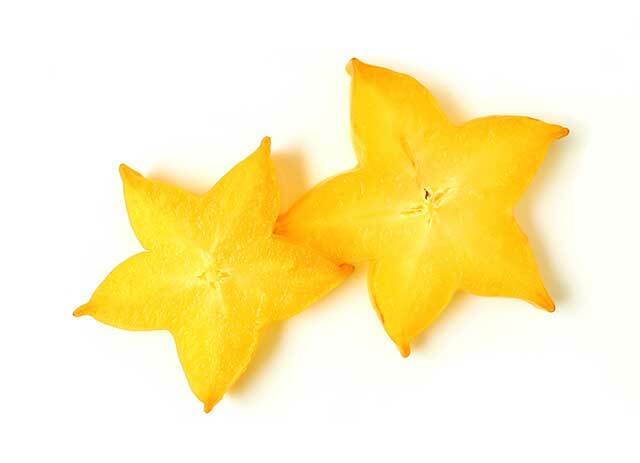 As shown above, star fruit is very low in total calories, carbohydrate, fat, and protein. Star fruit provides a significant amount of vitamin C and a small amount of other vitamins. Star fruit does not provide a significant source of minerals. However, it does offer small amounts of copper and potassium. Key Point: Star fruit is a low-calorie and low-sugar fruit, and it is an excellent source of vitamin C.
Star fruit has several health benefits, but it is not a magical food that can cure all your problems. Unfortunately, exotic foods often have their health benefits exaggerated on the Internet, and this is something that happens a lot with star fruit. That said, the fruit does have several positive points, most of which relate to the nutrients and chemical compounds that it contains. Here is an overview of the health benefits star fruit can provide. As shown in the nutrition tables, a medium star fruit offers a notable amount of vitamin C, accounting for 52 % of the daily value. Firstly, star fruit is very low in energy, with one average-sized portion containing 28 calories. For anyone who is counting their calories, star fruit offers similar or better benefits (vitamin C) compared to other tropical fruits like mango, papaya, pineapple, and jackfruit for significantly fewer calories (8, 9). Secondly, star fruit is low in carbs. For example, a regular-sized portion provides little more than six grams of carbohydrate, and 2.5 grams of this is fiber. As a result, star fruit is a good choice of fruit for anyone on low carb or ketogenic style diets. Lastly, a portion of star fruit contains only 3.6 grams of sugar (3). Although sugar in whole food sources is not the same as refined sugar, some people prefer to limit their fructose intake, which makes star fruit an excellent choice for these people. As previously mentioned, star fruit is more than 90% pure water by weight (2). Watermelon contains a slightly higher (91%) amount of water, but star fruit is one of the most hydrating fruit and vegetables (10). Compared to other fruit, star fruit is a good choice for a hot and humid day, or when thirsty after exercise. 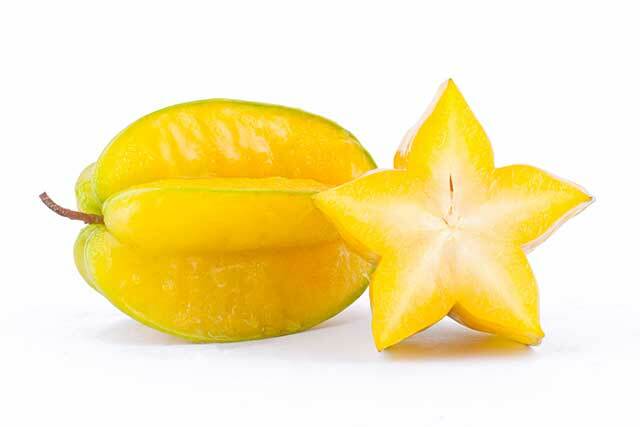 Starfruit contains a significant concentration of polyphenols. 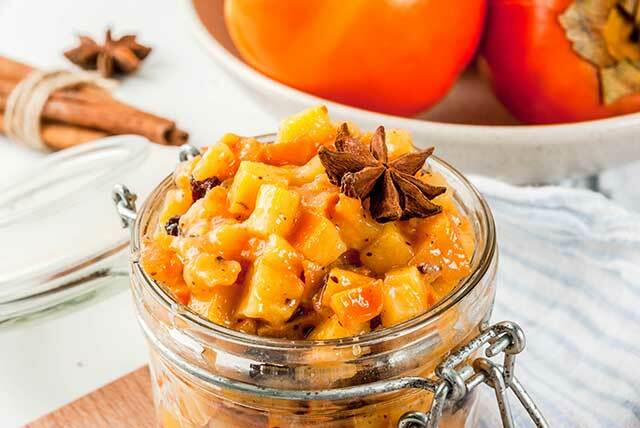 An analysis of the polyphenolic content of star fruit demonstrates that it is rich in the phenol classes flavonoids, phenolic acids, saponins, and terpenoids (11). There is a lot that we are yet to understand about polyphenols and the way they work, and research is currently ongoing. However, research has shown that these compounds may have a positive impact on anti-inflammatory processes (12). Additionally, research specifically on star fruit’s polyphenols has shown that the fruit may have blood glucose-lowering effects in animal and human studies (13, 14, 15). However, it is worth noting that these studies used high-strength extracts, and we cannot presume that just eating the fruit has the same effect. Almost half the carbohydrate content in star fruit is from fiber. To be specific, a standard portion contains 2.5 grams of fiber and 3.6 grams of sugar (3). As a result of this, star fruit will have a much lesser effect on blood glucose levels than high sugar, low fiber foods do. First, fiber does not digest into glucose in the same way that other carbohydrate does. Therefore, it will not lead to an increase in blood glucose levels. Secondly, fiber slows down the digestion of food, so the (minimal) fruit sugars in star fruit will digest slower and are less likely to cause a spike in glucose. Key Point: Due to the fiber content and minimal amount of fruit sugars, star fruit is unlikely to have a big effect on blood glucose levels. Unfortunately, there are also some concerns about star fruit consumption. 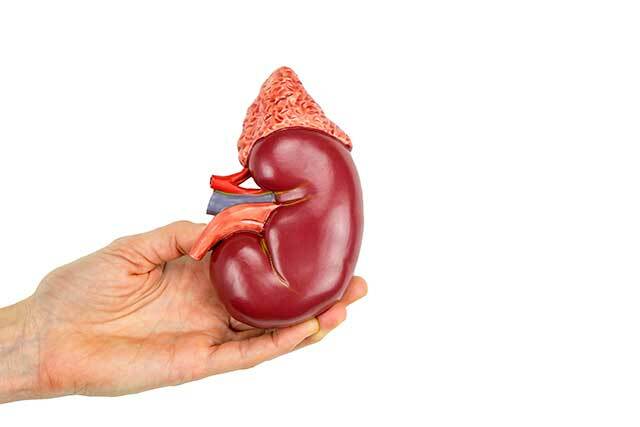 However, these mostly relate to individuals with pre-existing kidney disease. In short, star fruit can have a neurotoxic effect on patients with chronic kidney disease. In patients with kidney problems consuming star fruit, there have been 123 documented cases of neurotoxicity. 28 (22%) of these were fatal. However, a systematic review also found evidence of the fruit harming individuals who were seemingly free of kidney problems. Whether or not these individuals were simply undiagnosed is unclear (18). Hospitals have also reported serious adverse reactions (and deaths) when dialysis patients have eaten star fruit (19, 20). The reason for these severe reactions is because star fruit is a highly concentrated source of oxalate, which can cause kidney issues in high doses. It also contains a neurotoxin called caramboxin (21, 22). While healthy kidneys can deal with these compounds, damaged kidneys cannot. Due to these issues, researchers recommend that people with any kind of kidney issue avoid star fruit consumption. Star fruit is extremely toxic to dogs. Since most dogs will happily eat it if they get the chance, care is necessary. The reason for the toxicity is the extremely high oxalate concentration, and reports suggest a small amount is enough to cause problems. It may be better for dog owners to avoid the fruit to be on the safe side. Key Point: Starfruit is bad for people with kidney issues and it is also toxic to dogs. Anyone picking up a star fruit for the first time may wonder how they should eat it. Firstly, there are many different ways to consume the fruit, and different countries and people have various ways of using it. The first way is just by eating the pure, plain whole fruit. In South-East Asia, these fruits are a common ingredient in cooking, and you can find several star fruit recipes to try here. If you want to eat the fruit, then preparing it is much easier than it may seem. Firstly, the skin is edible, so it does not need removing. To prepare the fruit, all you have to do is cut it into slices from one end of the fruit to the other. Slices of around 1 cm in width is the norm. After slicing the fruit in this way, you will have lots of star-shaped slices to eat. Although these slices will contain seeds in the middle, these seeds are also edible (but you can easily remove them if you prefer). Key Point: You can eat star fruit alone or use it as an ingredient in cooking. There are many recipes available online. Star fruit is a tropical fruit with a unique taste and appearance. The fruit is a particularly good source of vitamin C, and for the majority of people, it is a healthy choice. However, people with kidney issues should strictly avoid it, and dog owners may wish to do the same. For more articles on tropical fruit, take a look at the nutrition benefits of rambutan.